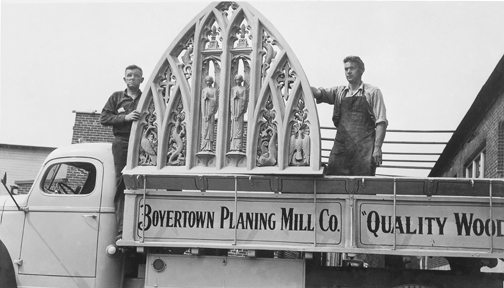 Boyertown Planing Mill has a rich history that dates back over a century. The mill is located in the heart of Boyertown and is owned by Susan J. and Thomas J. Wentzel, who purchased the business from J. Michael Levengood in 2006. The mill began operations officially in 1912 and incorporated in 1913. There is some data that claims the mill started closer to the turn of the 20th century. After a disastrous fire in 1922 at Rhoads and Jefferson Streets in Boyertown, the mill rebuilt at its current location at Second and Franklin Streets in Boyertown. J. Michael Levengood’s father, James C., began working at the planing mill in 1953 and bought the operation in 1975 along with several partners. In the early 1990s the senior Levengood bought out his partners after which J. Michael took over in 1994. Operations at the mill have changed over the years in response to the changes in the construction industry. At one time the mill provided only unfinished wooden goods such as wooden shipping crates (shooks), windows, doors and flooring. Today, the mill provides finished custom woodwork along with items made from more modern and high-performance materials. Over the years, Boyertown Planing Mill has made its mark in the architectural millwork industry with products such as cabinets, mouldings, trim, custom doors, wall paneling, high end receptions desks and historic restoration millwork. Our cabinetmakers are true craftsmen with over a combined 500 years of experience in the woodworking industry. Most have graduated from high school career centers such as Berks Career and Technology Center and several have graduated from Thaddeus Stevens College of Technology located in Lancaster, PA.
We pride ourselves in our attention to detail and working closely with our clients, owners and architects to provide our clients and general contractors with a project that surpasses expectations. Boyertown Planing Mill has provided millwork for clients including Intech Construction, C. Erickson & Sons, DJ Keating, Flatiron Construction and LaMarra Construction to name a few. We have worked on projects such as the Hotel @ 1 Logan, the Union League, Curtis Music Institute, Lankanau Hospital, the University of Pennsylvania, Law offices of Stradley Ronon and the Free Library of Philadelphia to name a few. Boyertown is certified by the Architectural Woodworking Institute (AWI), the QCI program of AWI and we are a Women’s Business Enterprise(WBE).